Get Rid of Your Student Loans Without Paying for Them! I’m going to let you in on a little secret: in 2019, it’s possible to get rid of your student loan debt without paying a single cent! How? Via a variety of Student Loan Forgiveness Programs, which are now readily available for both Federal and Private Student Loans. There’s never been a better opportunity to qualify for Private and Federal Student Loan Forgiveness Benefits, as there are literally tons of different programs available, so be sure to browse through my list below and you’re almost certain to find a forgiveness program that can help you get rid of student loans quickly and easily. The dirty little secret to the student loan industry is that schools, lenders, and student loan servicing companies don’t want you to know how to get rid of your loans, because that costs them money, but I’m going to blow the lid off the biggest secret about student loans: the fact that they’re really not that hard to get rid of! What Are the Best Student Loan Forgiveness Programs for 2019? First, you’ll have to determine whether your loans are Federal, or Private, and then you’ll need to navigate to the section of this page covering your type of loan, as your loan type is the most important factor in determining which forgiveness programs you’ll qualify for. Keep in mind that while it’s way easier to get rid of Federal loans (because there are so many more programs for them), it’s no longer impossible to qualify for excellent Private Student Loan Forgiveness benefits too, because there are definitely some great options out there now! Please read through the Forgiveness and Discharge Programs listed below, see what you think you may qualify for, then click the links to go to other pages of my site where I explain each program in extreme detail. If you have questions about anything I’ve covered on this page, feel free to leave a Comment and I’ll do my best to get back to you in 24 hours! There are two main types of Forgiveness benefits available for borrowers with Federal student loans, including the traditional “Forgiveness” programs, and the more modern “Discharge” programs. The difference between them is that Forgiveness programs typically take a longer time to qualify for, whereas Discharge programs let you get rid of your loans in an instant. 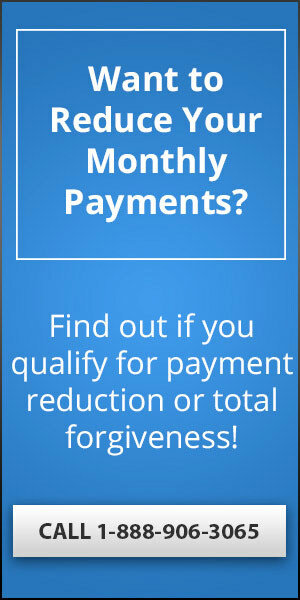 Most Forgiveness programs only allow you to get rid of your loans after you’ve made a certain number of payments toward them (typically, they require 10, 15 or 20 years worth of payments), but they’re the type of program more people will qualify for, since they’ve got easier eligibility conditions. In contrast, the Discharge programs let you wipe your loans out right away (based on certain guidelines you must meet), but they’re much harder to qualify for because they’re only available to a tiny slice of the population of people with student loan debt. Below, I’ll go through each available Forgiveness and Discharge program in detail, so prepare for heavy reading, because you’ll need to get into specifics to determine which program will work best for you. All of the programs above are excellent opportunities for getting rid of your loans, but remember that most of them are going to require many years of payments before you can get rid of your debt (except some of the Healthcare and Nursing programs, which are super accelerated). Next, let’s discuss the more modern Federal Student Loan Discharge programs, which let you get rid of your loans more quickly than the older Forgiveness Programs, but which are much harder to qualify for since they’re only available to small portions of the population. Like I mentioned earlier, these programs let you wipe out your student loan debt in an instant, but the downside to Discharge programs is that they’re much more difficult to qualify for because of restrictive eligibility conditions. Now that we’ve covered the Federal student loan forgiveness programs in exhausting detail, let’s do the same thing for those of you holding Private student loan debt. Remember, in years past, Private loans have been nearly impossible to get rid of via Forgiveness or Discharge programs, but that has all changed in recent years with the expansion of new opportunities for wiping out your Private loans. And on the Private side, unlike Federal Forgiveness, there’s no real divide between “Forgiveness” and “Discharges”, because anything related to Private debt tends to happen right away, so while there are certainly fewer opportunities for getting rid of your Private loans, those opportunities are better in a way since they don’t require years and years of patience while waiting for the benefits to kick in. Hopefully, you’ll find yourself eligible to take advantage of one of the programs listed above, as these are by far the best ways to get rid of your Private student loan debt. The good news is that if you’re willing to invest some time poking around my site, you’re almost guaranteed to find a benefit program that’ll help you get rid of (or at last reduce) your private student loan debt quickly, and affordably. And if you really aren’t able to qualify for any of the programs I’ve covered here, then you may simply need to deploy some creativity towards how you live your life, like by getting paid exclusively under the table (so the IRS/Debt Collectors think you’ve got no income), moving to a foreign country (making you untouchable to U.S.-based Corporations), or living entirely off the grid (so you have no money to take)! Should You Pay Someone to Help? One big decision you’ll need to make is whether you want to tackle your loans entirely on your own, or with the assistance of a Student Loan Relief Company. But you’ll need to be extremely careful about who you choose to work with, because there are literally thousands of Student Loan Forgiveness Scams in operation across the country now, and you definitely don’t want to fall into line with one of them. The benefits of hiring a Student Loan Debt Relief Agency are that they can save you time, money, and stress by making sure that you’re aware of all the opportunities available for reducing or eliminating your debt, and by protecting you from making any mistakes with your applications to available debt forgiveness and discharge programs. And that may seem like no big deal, but when it’s taking over a year to hear back from the Department of Education on the status of Borrower’s Defense Against Repayment Applications, that means you’ve got THOUSANDS of reasons (read: DOLLARS) to get it right the first time around! As I mentioned earlier in this post, here’s the basic rundown on all the amazing Federal Student Loan Forgiveness Programs available this year. For specific details on each program, you’ll need to click the links leading to program-specific pages of my site, where I review the programs comprehensively. Obama Loan Forgiveness may be old, but it’s still one of the best student loan forgiveness programs available to anyone, and it’s the OG of forgiveness programs. To qualify for Obama forgiveness, all you have to do is sign up for either the Pay As You Earn Student Loan Repayment Plan, or the REPAYE Student Loan Repayment Plan, then make 20 years worth of payments toward your loans, and whatever amount you still owe will be entirely forgiven. This program is available to EVERYONE with Federal student loans, so it’s one of the first places you should look for assistance if you’re trying to get rid of Federal debt. For all the details about how it works, please visit my page on President Obama’s Student Loan Forgiveness Program. Part of the Obama Loan Forgiveness Program, Pay As You Earn is one of the best income-based Federal Student Loan Repayment Plans available this year, and it’s only downside is that it’s only available to people who took out loans on or after October 1st, 2007. It works the same way as Obama Loan Forgiveness, in that it sets your monthly student loan payments to an amount based on your annual income (the more you make, the more you have to pay), but it offers complete Federal student loan forgiveness benefits after you’ve made a certain number of payments: 240 payments, or 20 years worth of payments. Abbreviated “PAYE”, this is one of the most powerful Federal forgiveness programs on the market, and one that you should definitely look into if your loans were taken out after 2007, because it is the most widely available forgiveness benefit, and one of the easiest to qualify for. For details on how PAYE forgiveness works, please visit my page about the Pay As You Earn Student Loan Repayment Plan. The REPAYE Student Loan Repayment Plan was introduced after people heavily protested President Obama’s limitations included with the introduction of the Pay As You Earn Repayment Plan (PAYE), which limited forgiveness to people who had taken their loans out on or after October 1st, 2007. This obviously pissed off a ton of people, since there were literally millions of Americans already buried in student loan debt, looking for an effective solution, and blocked from using Obama Loan Forgiveness just because their loans had already existed before the introduction of his new reforms. REPAYE works the same was as PAYE, setting your monthly student loan payments based on your annual income (with lower payments for people who make less money, including the possibility of qualifying for a $0 monthly payment! ), and the opportunity to qualify for complete loan forgiveness after you’ve made 240 monthly payments (20 years worth of payments). For all the details on how REPAYE works, please visit my page on the REPAYE Federal Student Loan Repayment Plan. During the 2016 Presidential Election, I thought then Candidate Trump had a good chance of becoming the first Student Loan President, but my dreams have been dashed by all the terrible decisions his Secretary of Education Betsy DeVos has made since being appointed. No one yet knows what’s going to happen when President Trump finally announces his reforms to Federal student loan laws, including Obama’s student loan forgiveness program, but I’m still hoping beyond hope that he’ll make things better than they currently are (and doubting with each passing day that this will be the case). There’s a good chance that President Trump is going to significantly reduce benefits, making it harder to qualify for forgiveness, and potentially even getting rid of the forgiveness option entirely. We won’t know until his official plans are announced, so for now, we’ll all just have to hang tight. For speculation on what I think is going to happen, however, please visit my page on President Donald Trump’s Student Loan Forgiveness Program. The Public Service Loan Forgiveness Program remains the BEST, FASTEST and MOST POWERFUL Federal Student Loan Forgiveness Program that’s widely available to the average person. Abbreviated PSLF, this program offers complete Federal student loan forgiveness benefits after making just 120 monthly payments (half the time required by the standard Obama/PAYE/REPAYE Forgiveness Program), but even better is that it doesn’t require you to pay any taxes on the amount of money you have forgiven! PSLF is available to anyone who works in a Full-Time Public Service Position, and that has a pretty broad definition, covering all sorts of employments, from Government Employees to Non-Profit Workers, Military Personnel, Firefighters, Police Officers, Politicians and all sorts of other roles. If you’ve got Federal student loans, then you should be doing everything you can to qualify for PSLF, because it’s going to be by far the best way to wipe out your loans quickly, and affordably. For details on how it works, please visit my on the Public Service Loan Forgiveness Program. There’s a bunch of benefits to working in the Healthcare field, from feeling good about saving lives to easily finding new employment positions no matter where you live, but one of the biggest benefits is that working in Healthcare qualifies you for some amazing Federal student loan forgiveness benefits. In the past, most people have thought of the Healthcare forgiveness programs as being limited to Nurses and Doctors, but there are now all sorts of programs created to help virtually anyone in the industry wipe out their Federal debt, and I’ve created pages to cover each of these programs in detail. I’ll cover all the Nursing programs below, but if you’re working in a different role in the Healthcare industry, then you’ll want to look at my pages about the Perkins Loan Forgiveness Program for Nurses & Licensed Medical Technicians, The National Health Service Corps Loan Repayment Program (NHSC LRP), the National Health Service Corps Students to Service Loan Repayment Program (S2S LRP), and of course the Public Service Loan Forgiveness Program, which many medical personnel end up qualifying for as well. Very few professions tend to rack up as much student loan debt as Nurses, but fortunately, the Government has responded to the issue by creating all sorts of incredible Nursing student loan forgiveness programs. Nurses will qualify for all the programs mentioned above in the section about Healthcare Employee Student Loan Forgiveness Programs, but they’ve also got access to many programs made just for Nurses themselves, including the NURSE Corps Loan Repayment Program and the National Health Service Corps NURSE Corps Scholarship Program. MANY Nurses will also qualify for the excellent benefits offered under the Public Service Loan Forgiveness Program, so that’s another package definitely worth looking into if you’re serving as a Nurse in any capacity. For details on all the incredible student loan forgiveness benefits available to working Nurses, please visit my page on Nursing Student Loan Forgiveness Programs. Doctors and Dentists are perhaps the most in need of student loan forgiveness benefits, considering how easy it is for them to rack up $500,000 of more in student loan debt by the time they finally get out of Medical or Dental School, and the Federal Government now offers tons of potential forgiveness benefits to working Doctors and Dentists. The most obvious program that Doctors and Dentists can take advantage of is the National Health Service Corps Students to Service Loan Repayment Program (“S2S LRP”), which lets Doctors and Dentists qualify for up to $120,000 in forgiveness benefits for agreeing to work in a community that doesn’t have great access to modern medical or dental services. This program is eligible to apply to during your final year of Medical or Dental school, and basically means that you have to live in an inner-city or rural environment (where Doctors and Dentists don’t want to live! ), in order to qualify for the funds, but it’s a great way to put a huge dent into your student loan debt quickly and easily, without having to do anything totally crazy. For details on how the S2S LRP Program operates, please visit my page on the NHSC’s Students to Service Loan Repayment Program for Doctors and Dentists. Because Society (and the Federal Government) see Non-Profit’s as a public good, they’ve created an excellent incentive to working at a 501(c)(3) Organization: access to the incredible Public Service Loan Forgiveness Program. That’s right! 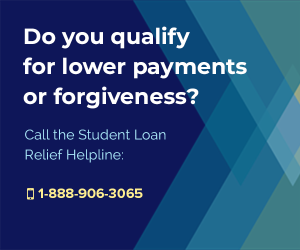 ANYONE who works full-time at a qualifying 501(c)(3) Organization can gain access to the single-best Federal Student Loan Forgiveness Program in existence, PSLF, which offers complete student loan forgiveness benefits after you’ve made 10 years worth of payments, and which does NOT require you to list the amount of money forgiven on your annual IRS return, meaning it WILL NOT BE TAXED! To earn Non-Profit forgiveness, you’ll need to work full-time at a 501(c)(3) for a period of 10 years, and be making your monthly student loan payments on time, and in full, for that entire 10 year period. The real stipulation is that you make 120 on-time, in-full payments, with payments set based on your income (make sure you’re enrolled in one of the Income-Based Federal Student Loan Repayment Plans!) in order to receive forgiveness. This is a great program, and potentially my favorite of all the Federal Forgiveness benefit packages, because I am painfully aware that Non-Profit Workers typically make less money than their private sector, For-Profit Working counterparts, and I am huge fan of people setting up and running Non-Profits that provide a public good to greater society. For a complete breakdown of how it all works, be sure to visit my page about the Non-Profit Employee Student Loan Forgiveness Program. Anyone serving in the Military has no reason to fear student loan debt, because Military Personnel get access to some of the absolute best student loan forgiveness benefits around. There are a ton of different Military Education Benefits Programs floating around these days, from the all-encompassing and new Forever GI Bill, to the Yellow Ribbon Program, Military Tuition Assistance Programs, and even Military Spouse Benefits Programs, but the most powerful of them all would have to be the Military’s College Loan Repayment Program, abbreviated as CLRP. CLRP provides up to $65,000 in student loan forgiveness benefits to qualifying Military Personnel, with the amount you’re able to qualify for determined by your Service Branch, and MOS Code. Some Branches offer better benefits than others, and in some branches, only certain MOS Codes will qualify for the benefit, but for those who can swing it, this is an excellent opportunity. For details on how it works, be sure to visit my page about the Military College Loan Repayment Program, and the specific pages talking about CLRP benefits for each branch of the military, including the Army Student Loan Repayment Program, the Navy Student Loan Repayment Program, the Air Force College Loan Repayment Program, and the National Guard Student Loan Repayment Program. Finally, for those who have trouble qualifying for CLRP benefits, don’t forget that you also have access to the most powerful Federal Student Loan Forgiveness Program on the planet: the Public Service Loan Forgiveness Program, which allows you to qualify for a complete student loan discharge after making just 10 years worth of income-based payments toward your debt, and which prevents you from having to pay any taxes on whatever amount of money ends up being forgiven. For more detail on all of the programs I mentioned above, please visit my page covering the Military Student Loan Forgiveness Programs. Nobody deserves Student Loan Forgiveness Benefits more than Teachers, and thankfully, this underappreciated, but vital section of the workforce finally has access to some excellent financial assistance programs that’ll help them reduce their student loans via Forgiveness benefits. Popular, newer Teacher Student Loan Forgiveness Programs include ways to reduce your debt before it’s been collected, like via the excellent Federal TEACH Grant Program, to the HRSA’s Healthcare Faculty Loan Repayment Program, which helps healthcare Teachers reduce their student loan balances. But the traditional mainstays of Teacher Forgiveness benefits are the ancient Stafford Loan Forgiveness Program, and Perkins Loan Forgiveness Program (technically referred to as the “Teacher Loan Cancellation Program”). Some Teachers, depending on their employment, may also qualify for the amazing Public Service Loan Forgiveness Program, so if you’re a Teacher, or planning on becoming one, I would absoultely recommend looking into the details of how PSLF works. For detailed information on how all of these programs work, please visit my page about Teacher Student Loan Forgiveness Programs. Is anyone as underpaid (or underappreciated) as Government Employees? I doubt it, but the good news is that anyone who works for the Government, at any level, including Federal, State, and even Local Government entities, qualifies for incredible student loan forgiveness benefits under the Public Service Loan Forgiveness Program. Many people think that it’s just Federal Employees who can qualify for have their loans forgiven, but that’s far from true, since every single “Government” worker has access to the same benefits package, with the same requirements, same application process, and same forgiveness at the end of the tunnel: total Federal student loan forgiveness for 10 years of service (meaning making 120 full, on time payments under one of the Federal Income-Based Student Loan Repayment Plans). Whether you’re the Mayor of your town, or a sitting United States Senator, you’ve got access to PSLF benefits, and you should be using them, because they remain the fastest, most efficient and single-best way to wipe out Federal student loan debt. To find out how it all works, please visit my page about the Government Employee Student Loan Forgiveness Program. In addition to all the excellent benefits offered by the Federal Government, MOST States have their very own State-Based Student Loan Forgiveness Programs, with some offering exceptional benefits, while others are hardly worth reading about. There’s no quick or easy way to sort out who’s got the best benefits though, unless you simply read through them all, so I’ll outline all of the available State-Based Forgiveness Programs in detail at the end of this page. One thing to keep in mind is that most States offer forgiveness benefits based on employment positions, and that virtually all of these programs have been created for healthcare workers (especially Doctors and Nurses), as a way to encourage more medical personnel to migrate to the state offering the benefits. You’ll just have to look through the State-Based Plans to figure out which one may work best for you, but you can find the list of them by looking at my page on State-Based Student Loan Forgiveness Programs. As I mentioned earlier in this post, here’s a quick introduction to all the excellent Federal Student Loan Discharge Programs available this year. For additional details on each program, make sure to click the links leading to program-specific pages of my site. If you follow those links, you’ll find an exhaustive description of how each program works, including eligibility restrictions, applications instructions, and additional details. The Borrower’s Defense Against Repayment Program is the fastest, easiest way to get rid of student loan debt, because it lets you wipe your loans out in an instant if you can prove that they are legally invalid. How could you prove that your loans shouldn’t legally exist? By convincing the Department of Education that they were only created because the school you took them out to attend, or the servicer who is handling your payments, has violated some state or local law, essentially defrauding you. This program is perfect for people who attended a For-Profit School that used deceptive advertising practices, especially if they ran big marketing campaigns talking about how much money their graduates earned, or promising high job placement rates within the field. For details on how it works, please visit my page about the Borrower’s Defense Against Repayment Program. For years, people have thought it impossible to get rid of Federal student loans by filing for bankruptcy, but that’s simply no longer true. Since I started following the student loans industry, I’ve noted many cases where people were able to discharge their Federal loans via bankruptcy, though I do have to say that it’s still one of the hardest ways to get rid of your debt. Why? Because it requires passing an extraordinary restrictive “Test”, which forces you to prove that your student loan debt is so debilitating, it’s literally making it difficult for your to afford paying for essential things, like food, clothing and shelter. Anyone who makes any reasonable amount of money, or who is young, or who earned a degree in a field that may lead to good employment prospects will be virtually incapable of passing the Bankruptcy discharge tests, so Bankruptcy is really only an option for people who are totally destitute, and buried in debt. As an example, if you’re middle-aged, unemployed, have several dependents, and owe hundreds of thousands in student loans, then you MAY have a chance at qualifying for a bankruptcy discharge, but if you’re not all those things, then you’ll probably want to look elsewhere for forgiveness opportunities. Anyone who attended a school that shut down before they could graduate will have an excellent opportunity to get rid of their Federal loans via the Closed School Loan Discharge Program, which was created to protect students from being totally screwed when their schools shutter their doors. This program has become extremely popular in recent years, especially as the gigantic For-Profit Universities have been shutting down like crazy, including recent closures for such industry giants like ITT Tech, Corinthian Colleges (Heald, Everest and Wyotech), and Westwood College. If you attended (or are attending) a school that shut (or is planning to shut) then you’ll want to pay careful attention to this program, because it’s a huge opportunity for you to unload all your student loan debt related to attending that school. For all the specific details on how the program works, how to apply for the discharge, and more, please visit my page about the Closed School Student Loan Discharge Program. If you went to DeVry, you’ve got a very good chance at getting your loans discharged via the Borrower’s Defense to Repayment Program, which lets you challenge the legal validity of your loans by claiming that DeVry defrauded you in order to convince you to enroll in their higher education programs. And if ANY school deserves to have to pay back it’s students via Borrower’s Defense to Repayment, it’s definitely DeVry, who has not just been accused of, but has admitted to doing all sorts of totally illegal and terribly immoral stuff. What did DeVry do? How about completely lying about graduate rates, job placement rates, average incomes, and making the ridiculous claim that graduates of their schools were finding higher salaries than graduates from competitors? There’s a whole laundry list of things DeVry did that constitute illegal marketing behavior, essentially by performing false advertising, and making false promises that constitute literal fraud, but I won’t go into it all here. If you want to find out how to get your DeVry loans discharged, and how you may be able to qualify for a refund on any money you’ve already paid DeVry, then visit my page on the DeVry Student Loan Forgiveness Program. ITT Tech is another For-Profit industry giant who ended up collapsing under it’s own weight, probably due to spending so much money on advertising and enrolling anyone with a heartbeat, including millions of students who ended up defaulting on their loans. This is another school I’m glad to see gone, as I don’t think they were doing a good job of providing valuable educational services to their students, and it seems like the marketplace agrees, as ITT Tech has completely ceased operations, making all loans related to the school eligible for the Federal Closed School Discharge Program. If you attended ITT Tech, then there’s a pretty good chance that you’ll qualify for a Discharge, especially if you never graduated, and were still a student around the time that the school shuttered it’s doors. To find out if you qualify for a discharge for your ITT Tech loans, please visit my page on the ITT Tech Student Loan Forgiveness Program. How could I cover For-Profit giants without speaking about the University of Phoenix, the literal definition of a For-Profit University, and perhaps one of the most nefarious (in my opinion) businesses ever to be founded in the history of mankind. I shouldn’t treat them so harshly, but the problem I have with the University of Phoenix is that they turned higher education into a business, and in that process, removed all the elegance, ambiance and soul from what should be a much more meaningful experience: learning how to act, think, and operate like a mature adult. UOP successfully mechanized the higher education process, making it available to everyone, including people who had no business applying to and attending four year college degree programs, but they’re now paying for their mistakes in that they too have fallen prey to the Borrower’s Defense Against Repayment Program. If you attended the University of Phoenix, and feel like you were taken advantage of, lied to, or made false promises, then you need to look into wiping out your UOP loans by filing a Borrower’s Defense Discharge Application. For details on how to do that, please visit my page on the University of Phoenix Student Loan Forgiveness Program. Westwood College has been accused of doing a lot of the same illegal and immoral things as DeVry, ITT Tech, University of Phoenix and basically all the other massive For-Profit Colleges, like making false promises, exaggerating their graduation rates and employment statistics, and basically committing fraud in order to increase student enrollment. Because Westwood participated in these illegal business practices, loans to attend the school are eligible for discharges via the Borrower’s Defense Against Repayment Program, and thousands of former Westwood students have successfully used this program to wipe out their related student debt. Fortunately, Westwood’s luck has completely run out, as they have closed campuses and suspended all teaching operations, which means that loans from Westwood are also now eligible for the Closed School Student Loan Discharge Program. If you attended Westwood College, you’ve got a pretty dang good chance or being able to discharge your loans, so be sure to visit my page on the Westwood College Student Loan Forgiveness Program, where I’ll explain what you need to do to wipe out your Westwood loans. It’s not just the schools that have taken advantage of American students, saddling them with outrageous levels of debt, and over promising the benefits of their higher education programs, but also student loan servicing companies who’ve done all sorts of wrong. The Federal Government, and some incredible industry watchdogs have recently initiated several rounds of lawsuits against some of the biggest Student Loan Servicing Companies on the planet, accusing them of doing all sorts of immoral and highly illegal activity, which opens student loans handled by these companies up to Borrower’s Defense Against Repayment opportunities. Virtually everyone with student loan debt has experienced the frustrating situation where their servicer screwed up a payment, or failed to inform them of some important change in the laws, or conditions of their loans or payments, but what most people don’t realize is that some of the servicing companies were doing this stuff ON PURPOSE to screw over their customers! Fortunately, it’s all out in the open now, and many of the nation’s biggest student loan servicers are being pummeled with lawsuits from groups like the Consumer Financial Protection Bureau or the Federal Trade Commission, accusing them of doing all sorts of terrible stuff, and leading to massive settlement agreements that will see borrowers getting all sorts of debt forgiven. FedLoan, one of the largest student loan servicing companies on the planet, has been accused of blatantly failing consumers and even maliciously mishandling their responsibilities as the sole servicing company for everyone enrolled in the Public Service Loan Forgiveness Program and the TEACH Grant Program. According to the lawsuit initiated against FedLoan by the Massachusetts Attorney General, FedLoan screwed up the annual income certification process so badly (and potentially purposefully) that hundreds of thousands of American borrowers have ended up with higher student loan costs as a result of their incompetence, which is an outright travesty. But that’s not all, because FedLoan is also accused of doing all sorts of other terrible things, including under-counting borrower’s payments and then placing the loans of borrowers into Forbearance when borrower’s disputed the statistics FedLoan reported, which leads to longer loan terms, higher costs due to increasing interest, etc. On the bright side, FedLoan’s failures (or malicious activity, depending on how you look at it) means that their borrowers may be able to pursue Borrower’s Defense Against Repayment Discharges, so if you’ve got a loan being serviced by them, then you’ll want to follow the eventual settlement developments closely. For specific details on how you may be able to get a discharge, be sure to visit my page about the FedLoan Student Loan Forgiveness Program. That is a direct quote from the Consumer Financial Protection Bureau, without any exaggeration or emphasis added by me, so you can be pretty sure that Navient is not only in serious trouble, but also potentially about the be the target of the biggest student loan forgiveness programs ever seen. There’s truly no telling how big the results of the CFPB’s lawsuit against Navient could be, but I’m almost certain that everyone with loans will get some kind of financial relief, so you’ll definitely want to track this development closely if you’ve got loans being serviced by them. 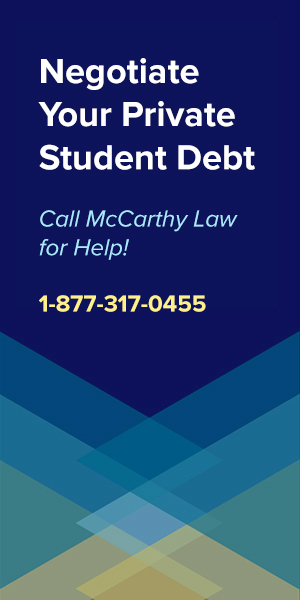 For specifics on the lawsuits Navient is facing, the things they’ve been accused of doing, and the possibility of getting your loans discharged via Borrower’s Defense to Repayment, please be sure to visit my page about the Navient Student Loan Forgiveness Program. The National Collegiate Student Loan Trusts is another servicing-related company that may end up ushering in one of the biggest student loan discharge programs ever, thanks to it’s sloppy record-keeping practices. This company hired a bunch of debt collection agencies to go after borrowers who had defaulted on their loans, but what emerged from the resulting lawsuits was that the company itself couldn’t even prove it actually owned the debt it was attempting to collect. And that’s great news for anyone that’s had anything to do with the National Collegiate Student Loan Trusts, or the debt collection agencies working for it, because apparently there’s about $5,000,000,000 ($5 BILLION) in student loan debt that the company has lost the records of, and which may end up being totally discharged because of legal complications. To find out how this story shakes out, please be sure to visit my page on the National Collegiate Student Loan Trusts Student Loan Forgiveness Program. Aequitas Capital is a huge Hedge Fund that was working with Corinthian Colleges (who has now closed) to help bilk Americans out of their hard-earned money. A lawsuit initiated by several Attorneys General accuses them of saddling students with “sham loans” created to line the pockets of Corinthian Colleges, and Aequitas, without providing any real value to the borrowers. And it’s a big deal, because even the SEC got involved in this investigation, and claimed that Aequitas and Corinthian had essentially established a Ponzi Scheme, which is one of the reasons that we may end up seeing tons of additional Corinthian loans being not only forgiven, but potentially refunded. To get the details on how it all works out, visit my page on the Aequitas Capital Student Loan Forgiveness Program. There’s never been a better time to try to get rid of private student loan debt than this year, because for the first time, there are all sorts of good private student loan forgiveness and discharge programs floating around. It’s true that the opportunities and fewer and far between than those offered to federal borrowers, but between options for programs like Borrower’s Defense Against Repayment and the Closed School Loan Discharge Program, there’s almost sure to be something for everyone here. Browse through the programs listed below to quickly see if any of these benefits programs may apply to your specific situation, then when you find one that you’re interested in, be sure to click the link to it’s program-specific page, where I go through all the details of how it works. 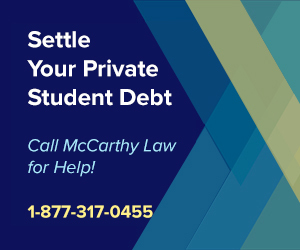 The single-most powerful and fastest way to wipe out your private student loan debt is filing a Borrower’s Defense Against Repayment Application, which accuses the school you attended, or your loan servicer, or doing something illegal in order to trick you into taking out your loans. In essence, filing for Borrower’s Defense requires accusing someone of fraud, and stating in legal language that you would never have agreed to borrower the money for your loans unless you were defrauded. In most cases, Borrower’s Defense Applications will attack the school the loans were taken out for, and accuse them of doing something like making false promises about graduation rates, salary expectations, or some other promise that the school couldn’t back up with data, or simply made up from thin air. There’s tons of examples of successful Bororwer’s Defense discharges being awarded to people with private loans, especially form some of the big for-profit schools like DeVry, Corinthian Colleges and Westwood, who are all in tons of legal trouble over shady advertising practices. 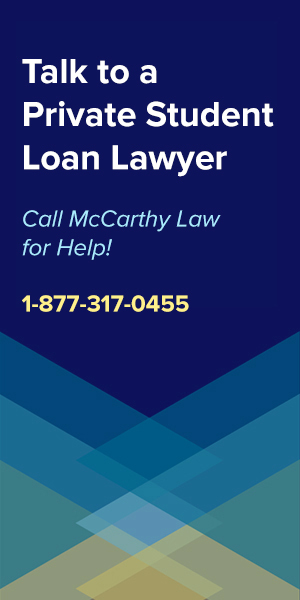 To find out how you can use Borrower’s Defense to get rid of your private loans, please visit my page about the Borrower’s Defense Against Repayment Program. Closed School Loan Discharges are an excellent way to get rid of your private debt, since they’re so easy to qualify for. The only problem with the Closed School Loan Discharge Program is that it’s only available to people who went to a school that has shut down, and shut down before they were able to graduate. That means that only a small portion of the private student loan borrowing population is likely to qualify for this program, but, if you attended one of the huge for-profit schools that shut it’s doors recently (like Corinthian, Heald, Everest, Wyotech, Westwood, or ITT Tech), then you’ll have a really good chance at wiping out your loans! To find out how to use this program to get rid of your private debt, please visit my page on the Closed School Student Loan Forgiveness Program. Corinthian Colleges was the first huge for-profit chain to shut down, closing in 2016 and stopping operations across all it’s campuses, including all Everest, Heald and WyoTech locations. This was a huge shot across the bow of the student loans industry, as it was the first time that any of the truly huge schools had taken a big financial hit, and it opened the door for many other schools to follow, including ITT Tech and Westwood, who both just recently ceased their own operations. You can qualify for forgiveness on your Corinthian loans in two ways: first, by pushing for a Borrower’s Defense Against Repayment Discharge, if you can prove that the school defrauded you in some way (that’s easy…), and second, through a Closed School Loan Discharge, which will work perfectly if you were still a student at the time the school closed. To find out how to take advantage of these excellent opportunities, please visit my page on the Corinthian Colleges Student Loan Forgiveness Program. ITT Tech is another gigantic entity that shut down without warning, leaving tens of thousands of students with no option to actually complete their degree programs they’d spent so much time and money on. Fortunately, since ITT shut down, anyone who was still a student at or near the time of it’s closure may be able to access Closed School Student Loan Discharge benefits, which are excellent, as they allow you to wipe out all of your remaining loan debt, for free! ITT Tech is also pretty vulnerable to Borrower’s Defense Against Repayment Discharges, especially since they spent so much time and money advertising on daytime tv, and making all sorts of outlandish claims about the value of their higher education programs. To find out how you can get rid of your ITT Loans, please visit my page about the ITT Tech Student Loan Forgiveness Program. DeVry is another one of those massive schools that signed up tons of students, charged them ridiculous prices, and maybe didn’t do that great a job preparing them to work in the real-world, and they’re paying the price ever since people became aware of Borrower’s Defense to Repayment Discharges. In fact, DeVry has been getting hammered with Borrower’s Defense Applications, especially since the FTC’s lawsuit made it so obvious that DeVry was vulnerable to fraudulent or misleading advertising claims. Anyone who’s been paying attention to the industry would know by now that there’s almost no better target school for a Borrower’s Defense Against Repayment Discharge, and if you attended DeVry, then you’d better get an application submitted soon, because the line has grown quite long. To find out how you can use Borrower’s Defense against DeVry, please visit my page on the DeVry Student Loan Forgiveness Program. Westwood is another big school that used to spend millions of dollars on advertising costs, but they too have gone dark after the for-profit schools started collapsing in on their own weight. I’ve known a few people who went to Westwood and got good educations, but they seem to be in the minority, as there are all sorts of terrible reviews for the school online, and like the other big for profits, Westwood made the mistake of making all sorts of outlandish claims in their ads, opening them up to Borrower’s Defense discharges. But that’s not all, because not only did Westwood do all sorts of stuff they shouldn’t have done to encourage more people to sign up, but they also screwed up their business, and ended up having to close down in 2017, opening their loans up to Closed School Student Loan Discharge benefits. To find out how to get your loans discharged via a Borrower’s Defense Against Repayment Application, and to see if you qualify for a Closed School Discharge, be sure to visit my page about the Westwood College Student Loan Forgiveness Program. 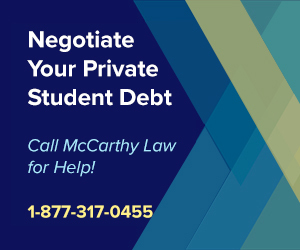 Borrower’s Defense Against Repayment doesn’t just work against schools, but can also be used to attack the legal validity of your loans if your student loan servicing company has done something illegal or fraudulent against you as well! And that’s a big deal, and a huge opportunity, because recent years have seen some massive lawsuits and major accusations of illegal behavior against some of the country’s biggest student loan servicing companies, like Navient, FedLoan, and others. Navient is one of the biggest student loan servicing companies on the planet, and they’re in big trouble with the Federal Government, the Consumer Financial Protection Bureau, and several Attorney Generals. According to a lawsuit filed against Navient in 2016 by the CFPB, the company “systematically and illegally fail[ed] borrowers at every stage of repayment”, causing borrowers to have to pay way more money than they should have. Which means that you may be able to qualify for a private student loan forgiveness discharge against Navient, via the Borrower’s Defense Against Repayment Program. To find out how this process would work, and what you’d need to do to apply for a Navient discharge, please visit my page about the Navient Student Loan Forgiveness Program. FedLoan is another massive student loan servicing company, and like Navient, FedLoan too is accused of some seriously shady business practices that open them up to Borrower’s Defense Applications. If you’ve got a loan with FedLoan, then I’d highly advise you to consider filing a Borrower’s Defense Against Repayment Program application, because there’s a very good chance that it’ll be fully approved. What did FedLoan actually do? Apparently they totally screwed up servicing for everybody enrolled in the Public Service Loan Forgiveness Program, and for everyone enrolled in the TEACH Grant Program, which is a big portion of the population, and a great reason for you to dig into this opportunity in detail. To find out how you may be able to discharge your FedLoan private loans, please visit my page about the FedLoan Student Loan Forgiveness Program. Aequitas Capital is just another company involved in scamming ordinary Americans out of millions of dollars via student loans, but they’re even more nefarious than these terrible student loan servicers, as they’ve been accused of establishing a Ponzi Scheme with Corinthian Colleges, and using it to bilk billions from potential Corinthian students. Fortunately, Aequitas is about reap what it sowed, as the SEC investigation into their operating practices fully exposed all the issues, and the lawsuit against Aequitas filed by several Attorneys General means that they too will fall victim to Borrower’s Defense Against Repayment Applications. If your loans are in any way tied to Aequitas, then you need to look into your options for getting them erased immediately. To find out how to get rid of your Aequitas Capital-connected private student loans, please visit my page on the Aequitas Capital Student Loan Forgiveness Program. The National Collegiate Trusts deserve a special place in hell, as this company is best known for aggressively pursuing private student loan defaulters, taking them to court and pressing for legal and financial recompense against the defaulted debters, while they can’t even prove that they own these loans! And while that sounds ridiculous, the fact is that the National Collegiate Trust appears to have lost the paperwork for over $5,000,000,000 ($5 BILLION!) dollars worth of loans, and they may end up having to completely forgive all that debt since they can’t prove that they really down own it. That’s right… if your loans have anything to do with the National Collegiate Trust, then you’ve got a pretty dang good chance at qualifying for a complete and total discharge, and soon. To find out how you could take advantage of National Collegiate’s ridiculous mistake, please visit my page about National Collegiate Trusts Student Loan Forgiveness. While many people think it’s impossible to get rid of private student loans via bankruptcy proceedings, I’m happy to report that this couldn’t be further from the truth! Private student loan debt definitely can be discharged via bankruptcy; it just takes a lot of work, and some really specific financials. To get rid of your loans in bankruptcy, you’ll have to prove to a court, or the Judge, that the loans are so large and so oppressive that they’re literally making it difficult for you to afford food,, shelter and clothing. Many courts have ruled in favor of the borrower in recent years, letting them discharge $100,000, $200,000 or even more, if they can prove that these loans are threatening their daily lives by saddling them with too much debt. It’s not easy, and it’s not all that straightforward either, but if you’re buried in private debt, not making much money, and have dependents, then you may have a shot at a discharge. For details, visit my page on Private Student Loan Bankruptcy Discharges. If you don’t think you qualify for any of the Forgiveness or Discharge programs I mentioned above, then don’t despair, because you may have other options! First, there’s all sorts of people offering help with consolidating private student loan debt, by combining multiple loans together, combining private loans with other forms of debt, or doing some other sort of consolidation that makes it a little easier for you to afford. Second, there are tons of private student loan modification programs floating around too, and you can sometimes even get your original lender to alter the conditions of your loan simply by reaching out to them to let them know that it’s basically that, or facing your default. And finally, there’s always the option of going belly-up and refusing to make any payments, or defaulting on your private loans. While I think you’ll almost always want to avoid a default, there are certain cases where it’s simply better financial advice to turn tail, cut and run, leaving it all on the lender. Below I’ll explain the basic points of each of these opportunities. If you’re interested in getting more detailed explanations of these programs, please make sure to click through the links to each program’s specific page on my site. Private student loan consolidation is not new, but it’s gotten much better in recent years. While I used to advise everyone to totally avoid consolidating their private loans, now I feel better about the process, and I no longer think it’s the worst idea in the world (that’d be default…). For people absolutely buried in way too much private student loan debt, or with loans that have terrible terms (high interest, short repayment schedules, etc. ), a private consolidation may be the best option for generating some real financial relief. If you need to combine your loans for any reason (with other student loans or other debt), then you definitely do want to consider a private consolidation. For details on how it all works, please visit my page on Private Student Loan Consolidation Programs. Loan modification programs are like consolidation programs, in that they can change the terms of your loan, saving you money by reducing monthly payments, getting a better interest rate, or doing any number of other things that help reduce your financial burden. However, loan modification programs have one special difference: they’re available to people who only have a single loan, meaning that more people are likely to qualify for loan mods than will for loan consolidations, since the population of borrowers is much higher. If you’ve only got one private student loan, and it’s destroying your finances, then you’ll want to see if you can get your loan servicer to agree to make loan modifications. Things to push for are lower interest rates (which save money both in the short term and long run), longer repayment terms (which reduce monthly payments, but end up costing you more money over the long run), or anything else that may be able to help ease your financial burden. You’re going to have to go it alone when it comes to Loan Modifications, as each servicer has their own specific rules for what’s possible, so you’ll need to call whoever you’re sending your monthly payments to, and start negotiating with them to see what you can accomplish. As an absolute last resort, there’s always the option of defaulting on your private loans, and simply refusing to pay another penny toward them. And while I think this is a terrible idea, and maybe even the worst I’ve ever conceived, there are very specific situations where it does kinda, sorta, make sense to default. Like, for example, if you’re planning on leaving the country, forever. Or, for example, if you’re working under the table, and you plan on doing that for the rest of your life. In almost all other cases, there’s no good reason to let your loans slip into default, because doing so brings financial and legal penalties that you’d definitely want to avoid if you can help it. For details on things to consider when looking at a default, and advice on how to go about it without risking everything, please visit my page on Getting Help With Private Student Loan Defaults. Wiping out your student loans is a HUGE deal, but before you start celebrations, you’ll need to make sure that you understand one thing quite clearly: debt forgiveness almost always comes with additional tax liabilities. What’s that mean? It means that if you get any amount of Federal or Private student loan debt forgiven, you’ll almost certainly have to include that amount of money in your IRS filings that year, as INCOME! Which means that you’ll not only be declaring a much higher income than usual, but paying taxes on it as well. And that’s a big deal, because if you couldn’t make your monthly student loan payment, then just imaging how hard it may be to come up with your IRS payment on forgiven student loan debt, which could amount to thousands or even tens of thousands of dollars being due, and all at once! That’s right – because the IRS isn’t like student loan servicing companies – they want their money all at once, in a single lump sum, meaning that you won’t be able to stretch it out over 10, 15, or 20 years. And that means that millions of ordinary Americans are about to get the shock of a lifetime, because most people who receive student loan forgiveness may get out of trouble with their student loan servicing company, only to fall into the trap of the IRS. To find out how to determine whether or not you’ll be taxed, and how much taxes you’ll end up owing thanks to your forgiveness benefits, please visit my page about Student Loan Forgiveness & Taxable Income Laws. Where to Go For Tax Help? If you’re already having trouble with the IRS, or if you simply want to avoid it, then I’ve got good news! I just recently created a new site called Forget Tax Debt, where I offer tax-related information just like I’ve done here for student loans, and which could help you figure out how to reduce or eliminate your IRS tax debt. If you’re looking for help Filing and Paying IRS Back Taxes, understanding the IRS Fresh Start Program, or determining how to qualify for IRS Debt Forgiveness Benefits, you’ll want to visit Forget Tax Debt, where I go through all these topics and more in extreme detail. Can I Get Rid of My Loans Without Paying For Them? Yes, you can, but it’s not easy. If you’ve got Federal loans, then you could get rid of them without paying for them by enrolling in an Income-Based Student Loan Repayment Plan, and making so little money that you qualify for a $0 monthly payment. If you can keep qualifying for $0 payments, and make enough of them (240 months for most people, 120 months for anyone qualifying for PSLF), then you’ll eventually be able to get your loans forgiven, having paid $0 in total. On the Private loans side, you could get rid of your loans without paying for them if you can get them discharged via a process like Borrower’s Defense to Repayment, which would invalidate them (legally), and require the servicer or school to wipe out your debt, and perhaps even repay anything you’ve already spent. Again, it’s not easy, but it definitely is possible. The fastest, easiest, and most effective way to get out of paying student loans is to qualify for one of the community service forgiveness programs below. My personal opinion is that the Public Service Loan Forgiveness Program is the absolute best way to wipe out student loans quickly. If you aren’t dead-set in a certain career, or if you have any chance of applying for positions within your field that would qualify for PSLF benefits, then you should absolutely pursue it. The Public Service Loan Forgiveness Program is the most powerful way to erase student loans, because it allows your debt to be completely forgiven as soon as you’ve made 120 monthly payments on it. That’s just 10 years worth of payments! Even if you still owed $200,000 after making 10 years of payments, you’d still be able to receive complete forgiveness for the debt. One trick to this program is that you have to be enrolled in the Pay As You Earn Repayment Plan, or one of the other income-based or income-contingent repayments plans for your payments to count toward the 120 threshold. Only Federal student loans are eligible for the PSLF program, and Parent PLUS loans are only eligible for it if they’re consolidated into a Direct Consolidation Loan, and being paid off under the standard or income-contingent repayment plan. Any non-Direct loans may be consolidated into Direct loans, but the payments made on the underlying loans before they were consolidated will not qualify toward the 120 payment threshold. Finally, only payments made on or after October 1st, 2007 can count toward the 120 payment threshold, meaning that the earliest anyone could receive PSLF forgiveness would be October 1st, 2017. Even though no one can qualify for the benefit for another couple years, you can find the application for PSLF online here. The Segal AmeriCorps Education Award is for anyone who has completed a term of service with AmeriCorps, and offers anyone who qualifies for the program the opportunity to receive the maximum Pell grant allotment for the current year for up to 4 years. In 2015, the maximum Pell Grant award is $5,730 per year, meaning that this benefit would be worth $22,920! To qualify for this benefit, you have to sign up to receive it before your AmeriCorps service, and you can only start using it after you’ve completed your full term of service. There is no partial allotment. Those who qualify to receive the benefit will have up to 7 years to apply it to their Federal student loans. One quick note about this program which is awesome is that you may still be able to apply the money earned from this benefit to your loans, even if they are in default! To apply for the Segal AmeriCorps Education Award, visit the AmeriCorps website. The Peace Corps Loan Forgiveness Program doesn’t actually exist. I use this phrase to refer to two different types of forgiveness benefits available to Peace Corps volunteers who have completed a term of service. The two programs that Peace Corps volunteers will be able to leverage are the Public Service Loan Forgiveness Program (outlined above) and the Perkins Loan Cancellation Program (you’ll find more info on that further down the page). As stated earlier, PSLF offers Federal student loan forgiveness after making just 120 monthly payments, but only payments made while you’re serving full-time in a public service capacity will count. Via the Perkins Loan Cancellation Program, Peace Corps volunteers can qualify for a 15% loan cancellation benefit for completing each of their first two years of service, as well as a 20% loan cancellation benefit for completing each of their third and fourth years. There’s a limitation on Peace Corps Perkins Loan Cancellation though – only 70% of your total Perkins Loan can be cancelled using the benefit. Also important to note here – whether or not you qualify for a forgiveness benefit due to your Peace Corps service, any service will qualify you for a Peace Corps Student Loan Deferment. Visit the official Peace Corps website and look at the “Certification for Partial Perkins Loan Cancellation” item here. All sorts of Student Loan Relief Programs have been created for people in varying professions. If you work in Education or Healthcare, you’re bound to qualify for one of the excellent forgiveness programs outlined below. The Faculty Loan Repayment Program (commonly referred to as FLRP) is the perfect program to introduce this section of the page, since it straddles the border between healthcare and education. This program offers up to $40,000 in student loan forgiveness benefits for 2 years of service to degree-trained health professionals from disadvantaged backgrounds who serve on the faculty at accredited health profession colleges or universities. You can increase your chances of being accepted into the program by working with your school to get a written statement saying that they will match equal FLRP loan repayments (meaning half the forgiveness comes from FLRP and the other half comes from the school itself). The big shocker here? FLRP works for both federal and private student loans. To enroll in the program, visit the HRSA website here. The Indian Health Services Loan Repayment Program is another one aimed at medical professionals, and offers up to $40,000 in loan forgiveness for 2 years of service at an Indian health program site. To qualify for this benefit, you have to commit to a 2-year service obligation where you’ll practice full-time at a qualifying site that primarily provides health care services to American Indian or Alaska Native communities. You’ll receive up to $20,000 in forgiveness benefits per year for each of your 2 years of completed service. Another shocker – this program also offers forgiveness benefits for private student loan debt! To apply, visit the official Indian Health Service website here. The John R. Justice Student Loan Repayment Program offers up to $60,000 in total student loan forgiveness, with up to $4,000 per year of service as an attorney continually licensed to practice law. Find out how to apply for this forgiveness plan by visiting the Equal Justice Works page on it here. The National Health Service Corps student loan forgiveness plan offers up to $60,000 in student loan forgiveness benefits for 2-years of service as a licensed primary care medical, dental, or mental and behavioral health provider working at a high-need site. It’s possible to receive even more money from this program after you’ve already receive your initial $60,000 in forgiveness for the first 2 years, but you’ll have to apply to that additional benefit after you’ve already received the first disbursement. This program is also run by the National Health Service Corps, but even though it’s Federally-funded, it too offers forgiveness benefits for both federal and private student loans. To apply for the National Health Service Corps student loan forgiveness plan, visit the official HRSA website here. This is one of the best student loan forgiveness programs available, as it offers up to $35,000 in forgiveness benefits PER YEAR for those that qualify. However, it’s also pretty difficult to meet the eligibility conditions as this program is only open to research professionals with doctoral degrees. The thing is – there are all sorts of people out there performing all sorts of research tasks, and anyone with a PhD (which this program requires), is likely to have a ton of student loan debt, so while this may sound like a long shot, there are sure to be plenty of participants. Also, I’m having trouble wrapping my head around this part, but apparently part-time federal employees who work less than 20 hours a week, but who meet the other research criteria, may also apply for the benefit. Another great part about this program is that it offers assistance to both federal and private student loan borrowers. Visit the official NIH Loan Repayment Forgiveness Program page here. The NURSE Corps Student Loan Repayment Program is an awesome benefit to anyone who’s working as a Registered Nurse (RN) or an advanced-practice RN. This program is extremely powerful, because it offers forgiveness for up to 85% of your loan for 3 years of qualifying service, or forgiveness for up to 60% of your loan for just 2 years of service. Also, unlike a lot of the other Federally-funded forgiveness programs, this one works for both federal and private student loans. The one trick is that not all RNs are eligible, and that you have to be working in a critical shortage facility or as nursing faculty working full time at an accredited school of nursing. I love this program though because of two reasons – first, nursing is a great field to get into (there’s always available jobs, pay is great, and the work is both rewarding and beneficial to society at large), and second, because compared to other advanced fields, it isn’t that difficult to get into and doesn’t require as much debt. If you’re a high school student, or someone in college who hasn’t quite figured out what to do with yourself yet, then you should definitely consider a career in nursing, and you should start preparing to take advantage of this excellent forgiveness plan. To apply for the NURSE Corps Loan Repayment Program, check out the official HRSA PDF here. The Perkins Loan Cancellation & Discharge Program offers comprehensive forgiveness benefits for a variety of different occupations. Probably the most popular form of Perkins Loan Forgiveness is the Teacher Loan Cancellation Program, which offers significant assistance to teachers working in shortage areas like math, science and foreign language (see details below). Perkins loan forgiveness is only available to those with qualifying Perkins loans, but it’s a great deal because it’s possible to have up to 100% of your outstanding principal balance AND accumulated interest completely cancelled! Note that above, you receive forgiveness percentages after each individual year of service. So after your 1st year of service, you’ll get 15% forgiveness. After you complete your 2nd year of service, you’ll get another 15% forgiven. Another awesome component to Perkins forgiveness is that you are able to qualify for deferments before you receive forgiveness, so you can postpone payment of your loans for as long as you are performing qualified service. If you play your cards right, you could even use Perkins loan forgiveness benefits to ensure that you never have to make an actual payment on your student loan debt! Attorneys: Full-time attorneys employed in federal public or community defender organizations who performed qualified service that on or after August 14th, 2008 are eligible to receive up to 100% forgiveness. Child or Family Services Workers: Full-time employees of a public or nonprofit child or family services agency that provides services to “high-risk” children from low-income communities are eligible to receive up to 100% forgiveness. Firefighters: Full-time firefighters who performed qualified service on or after August 14th, 2008 are eligible to receive up to 100% forgiveness. Head Start Employees: Full-time staff members in the education component of a Head Start program are eligible to receive up to 100% forgiveness, at 15% forgiveness per completed year of service. Military Personnel in Imminent Danger Areas: U.S. Military Personnel who were deployed to a hostile fire or imminent danger area are eligible to receive up to 50% forgiveness for active duty that ended before August 14,2008, and up to 100% forgiveness if active duty includes or began after August 14th, 2008. Intervention Service Providers: Full-time qualified professionals who provide early intervention services for disabled people on or after August 14th, 2008 are eligible to receive up to 100% forgiveness. Law Enforcement Personnel: Full-time law enforcement personnel and corrections officers are eligible to receive up to 100% forgiveness. Librarians: Librarian’s with Master’s Degrees working in Title I-eligible elementary or secondary schools, or in public libraries that serve Title I-eligible schools who worked on or after August 14th, 2008 are eligible to receive up to 100% forgiveness. Nurses & Medical Technicians: Full-time nurses or Licensed Medical Technicians are eligible to receive up to 100% forgiveness. Prekindergarten & Child Care Workers: Full-time staff members in prekindergatens or state licensed and regulated child care programs who worked on or after August 14th, 2008 are eligible for up to 100% forgiveness. Special Education Teachers: Full-time special education teachers working with children who have disabilities in a public school, nonprofit elementary or secondary school or educational service agencies are eligible to receive up to 100% forgiveness. Speech Pathologists: Full-time speech pathologists with a Master’s Degree working at a Title I-eligible elementary school or secondary school with service on or after August 14th, 2008 are eligible to receive up to 100% forgiveness. Educational Service Agency Teachers: Full-time teachers at a designated educatioanl service agency serving students from low-income families on or after August 14th, 2008 are eligible to receive up to 100% forgiveess. Teachers in Shortage Areas: Full-time teachers who teach math, science, foreign languages, bilingual education or other shortage areas are eligible to receive up to 100% forgiveness. Tribal College Faculty Members: Full-time faculty members at tribal colleges and universities who worked on or after August 14th, 2008 are eligible to receive up to 100% forgiveness. Vista & Peace Corp Volunteers: AmeriCorps, Vista and Peace Corps volunteers who served for at least a year are eligible to receive up to 70% of their loans forgiven, with 15% of the principal balance and accrued interest forgiven for the first and second years, and 20% forgiven for the third and fourth years of service. To apply for Perkins Loan Cancellation benefits, you’ll need to find the specific application form for the Perkins loan forgiveness plan that applies to your specific profession. A simple Google search should help. I already outlined this one above in the “Community Service” section, so if you’re interested in details, please scroll up to the first entry in the loan forgiveness section. Briefly, PSLF allows you to receive comprehensive loan forgiveness after making 10 years worth payments (120 payments) on your Federal student loans, cancelling the remaining debt no matter how much is left. The best part of the PSLF program is that you don’t have to work in a traditional community service position – you could be a Doctor, a Nurse, a Government Employee, a Nonprofit Employee or a variety of other positions and still qualify for PSLF. Find the Public Service Loan Forgiveness Application Form here. The Teacher Loan Forgiveness Program is also referred to as the Stafford Loan Forgiveness Program, and is an excellent benefit for those teachers willing to work in low-income schools. The way it works is that you’re able to receive up to $17,500 in federal loan forgiveness benefits for 5 complete and consecutive years of teaching at a qualifying school or educational service agency. To apply for the Teacher Loan Forgiveness Program, you’ll need to download the official application form here. One of the best ways to qualify for student loan forgiveness is via service with the United States military. Whether you want to join up as a Soldier, Sailor, Airmen or Reservist, military service virtually guarantees that you’ll be able to qualify for cancellation of student loan debt. The programs below don’t even get into all of the other excellent student loan relief opportunities offered by the military either, from the excellent Post 9/11 GI Bill Education Benefits package, to the awesome Military Tuition Assistance and Deferment programs. If you’re having trouble paying off your student loans, then you should consider looking to the military for help. Each branch of the United States Military offers it’s own version of a student loan forgiveness benefits, but some of them have better rewards than others. Benefits are best in the Army and Navy, who each allow enlistees to qualify for up to $65,000 in total lifetime forgiveness benefits, but they’re still good in the Air Force and Coast Guard as well. Marines, unfortunately, get nothing. Sorry guys. However, there’s a couple huge catches when it comes to qualifying for Military College Loan Repayment Program benefits – they’re only available to new enlistees, participation in the program requires sacrificing Post 9/11 GI Bill benefits (unless you agree to serve for a longer period of time), and participation in the program must be written into your original enlistment contract. For those of you already in the military, it’s too late to take advantage of these benefits. Oh, and I keep getting comments on my pages about these programs that the Government is not actually paying off what they’ve promised to do. I’ve been looking into it and I haven’t been able to find a good answer on why this is occuring, but I’ve heard from many Soldiers, Sailors and Airmen that benefits are not being paid in a timely fashion. For Soldiers, there’s virtually no better way to wipe out your debt than taking advantage of the Army Student Loan Repayment Program (typically referred to as SLRP). Army offers up to $65,000 in Federal student loan forgiveness benefits, making it one of the most powerful forgiveness programs on offer, and one that anyone buried in student loan debt should give some serious consideration. Army SLRP benefits are paid out annually, awarded to cover a certain percentage of your outstanding student loan debt (33.33% of whatever’s left), and issued after each year of service that you complete. The big downside to the SLRP program is that you can only receive these benefits if they were written into your original enlistment contract. Already in the Army? Unfortunately, it’s too late for you to enroll in this program. That part is pretty easy – when you go to enlist with the United States Army, speak to your recruiter and make sure that he puts participation in the Army SLRP program on your contract, in writing. This program is about the same as the standard Army SLRP program for active-duty Soldiers, except that you qualify it by joining the Reserves, and that you only qualify for having half the amount forgiven for each year of service you complete. Instead of getting the 33.33% of your remaining loan debt forgiven per year (like with Army SLRP), the Reserves CRLP program will earn you forgiveness for 15% of your outstanding loan balance after each completed year of service. Same as Army SLRP – when you go to join the Army Reserves, make sure that your recruiter includes participation in Army Reserves CLRP on your contract, in writing. The Navy College Loan Repayment Program is the best student loan forgiveness benefit available to Sailors. Navy CLRP benefits are identical to those offered by the Army, allowing Sailors to qualify for having up to $65,000 in total Federal student loan debt forgiven. Like Army SLRP, this benefit is offered incrementally, with a set 33.33% of the outstanding loan balance on qualifying loans being forgiven after each year of service the Sailor completes. And like Army SLRP, Navy CLRP benefits are only available to new Sailors, and participation in the program must be written into your original enlistment contract. When you go to enlist with the Navy, make sure that your recruiter puts your request to participate in this program on your enlistment contract, in writing. Naval Reserves members are eligible to receive similar benefits as active-duty Sailors, but at a reduced rate. For each year of completed service in the Reserves, Sailors are eligible to have 15% of the outstanding principal balance of their qualifying loans forgiven. Make sure that your enlistment contract spells out your participation in the program, in writing. If you fail to get this documented on the contract, you will not be able to leverage these benefits. The Air Force College Loan Repayment Program offers $10,000 in student loan repayment benefits to encourage the enlistment of new Airmen. Like the Army and Navy repayment program, this is also only available to new enlistees, and participation in Air Force CLRP must be stated in writing on your enlistment contract. Also like the Army and Navy version of the same program, you must agree to forget Post 9/11 GI Bill benefits in order to participate. The only way to get around that is to agree to enlist for 6 years (allowing you to take advantage of both CLRP benefits, and the Post 9/11 GI Bill). Air Force CLRP pays out benefits in annual installments, paying down 33.33% of your oustanding student loan debt for each year of service that you complete, until you’ve reached the lifetime maximum of $10,000 in total debt forgiveness. Like all the other military college loan repayment programs, you’ll need to speak to your recruiter at the time of enlistment. You will only be able to exercise these benefits if your participation in the program is spelled out in writing on your enlistment contract. The National Defense Student Loan Discharge offers debt forgiveness to military personnel who funded their college expenses with National Defense Student Loans or Federal Perkins Loans. This program requires completing one full year of service in a branch of United States military while deployed to a hostile fire or imminent danger pay area. Unfortunately, the amount of money that can be forgiven as part of this program is not publicized anywhere. All I know is that it offer a partial cancellation. If you believe that you satisfy the conditions of this program, you’ll need to send a copy of your DD214 (military discharge form) and a letter of explanation (explaining that you completed a year of service in the hostile fire or imminent danger pay area) to whoever services your loan. In your letter, make sure to state clearly that you qualify for the National Defense Student Loan Discharge, and say that you want them to apply it to your account. The Active Duty Health Professions Loan Repayment Program is for military personnel who are fully qualified health professionals (as determined by the United States military) who service in an identified skill-shortage area. To qualify for this benefit, you must also serve as a commissioned officer, and on active duty. Members of reserves units will not be eligible for the program. This is an excellent program, as it offers up to $40,000 in student loan forgiveness benefits. One other huge benefit to this program is that even Private Student Loans are eligible for forgiveness here. That’s exceptionally rare! 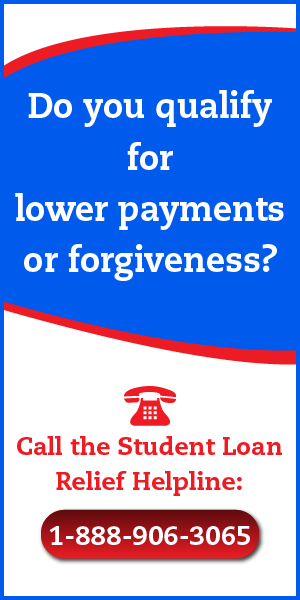 In fact, this may be the only true forgiveness program for private student loan debt. You can find detailed instructions on how this program works, as well as how to apply for it here. The Military Reserve Health Professionals Loan Repayment Program offers even more money than than the Active Duty program of the same name! This benefit offers up to $50,000 in total student loan forgiveness, with up to $20,000 of forgiveness offered for each year of completed service. To qualify for the program, you must either possess professional qualifications in a health profession that the Secretary of Defense has determined to be critically needed to meet medical skill shortages, or you must be enrolled in a program that will lead to the similar professional qualifications. Your length of service after the qualifying student loan was disbursed is what determines how much money you’ll receive each year, and in total. Like the Active Duty program of the same name – this is an excellent and unique opportunity for those who seek forgiveness from private loans. To apply for this benefit, you’ll need to speak to a Reserves recruiter. The National Guard Student Loan Repayment Program offers up to $50,000 in total student loan debt benefits, with up to $7,500 in forgiveness offered for each year of completed service. This program is another incentive for new enlistees, and requires signing up for a minimum service contract of at least 6 years. You must also fill a critical skills vacancy in the grade of E-4 or below, and be joining to hold a qualifying position in a Modified Table of Organization and Equity (MTOE) or Medical Table of Distribution Allowances (TDA) unit. Finally, you must score at least 50 on the Armed Forces Qualification Test (AFQT). This is another Military Forgiveness Program that must be spelled out in writing on your enlistment contract, so to apply you’ll need to speak with a recruiter. What do you think about the current state of the student loan debt crisis? Is there enough assistance offered to those holding massive student loans? Will the millennials ever be able to afford their own houses, start families, and live a normal life? Or will they be always saddled by excessive student loan debt? What could be done to improve the situation? Does anything need to be done? Or are people simply borrowing too much money without thinking of the long-term consequences? Did I miss any debt forgiveness, reduction, discharge or cancellation opportunities that you’re aware of? If you have the answers to any of these questions, please let me know in the comments section below. This site takes a great deal of work to maintain. I update content on a daily basis, investing hours of my time to ensure that you have access the latest, most accurate and most comprehensive information available anywhere online. Please, if you learned something from visiting my site, consider sending a link to it to your friends and colleagues over email, or even Social Media. The more people that visit Forget Student Loan Debt, the more time I can dedicate to ensuring that this remains the best resource on the web for people looking to find out how to get out of paying student loans. Thank you for visiting, and thank you so much for your support! I was browsing on different websites and was asked if I ever thought of going back to school which I had considered. Within 2 days, Kaplan called me and offered me to enroll in their online college stating that they were an accredited university that could guarantee me a degree in any chosen field within 18-24 months time without time restrictions on completion of assignments. I was working a 3rd shift job and taking care of my sickly mother at the time and this offer sounded appealing. I expressed to the admissions coordinator that I was financially unable to afford school even through an online forum. The coordinator continued to assure me that through applying for student loans and grants that I could continue to defer even after graduation if I was unable to find work in the area of study I choose. I expressed concern that it might adversely effect my credit in the future if I was unable to repay the loans. The coordinator repeatedly told me that they would ensure I find work after graduation no matter what my ending GPA was just as long as I passed. They guided me through applying for student loans via government websites which has since landed me in over $10,000 debt to Nelnet. I relocated from Va to Nc at the end of a semester and due to a natural disaster (Hurricane Harvey) internet and landline phones were out of service for almost a week. When I was able to access internet, I contacted my teachers asking for extensions which one granted and accepted late work and the other claimed to accept but still gave me zeros for final grades. I continued my education for one more semester even though I felt like there was a certain degree of deception going on.. After talking to my admission rep again, was told that they could “fix” my grades so that I could continue my medical billing and coding class without interruption that I would just have to reapply for additional loans to insure the classes were covered. My mother fell seriously ill with a brain tumor and I contacted my teachers asking for a medical leave so I could be with her. They referred me to my representative to apply and yet again the rep encouraged me to simply withdrawal and reapply again with new FSAFA application. Is this something that would make me eligible for student loan forgiveness? I am sorry to hear about your bad experience with the school, but I will tell you that none of the issues with your mother or your own personal problems are going to matter at all in applying for a discharge. This is a legal program that requires proving the school committed fraud against you in order to get your debt discharged. I do think that the fact that they guaranteed you a degree in in any field within 18-24 months without restrictions sounds like fraud, but I would also think about anything else that may have been promised before filling out your application. I would leave the issues with your mother and fixing grades and etc. out of your application. That stuff is not going to help you get an approval because it’s basically irrelevant to the way that this program works. Focus on the fraud. Present facts. Leave emotions aside. That’s how to get a discharge. Tim I understand the deferment for the student loans however what about those of us who paid cash for all of our classes. I got a masters degree and classes were several thousand each. Is there anything for us we too believed the lies that were told by UOP. Thanks for any information you may have. If you paid cash then there’s a good chance you won’t be eligible for anything. All the relief programs being created are primarily used to reduce existing debt. Refunds are very, very difficult to find. I’m currently in a student loan rehabilitation Program and I noticed my credit score is being fixed all the late payments are disappearing and are being marked as positive. That is a great sign however I still have other servicers like Nelnet who are still reporting negative information and I don’t think the rehabilitation programs covers the negative information that the servicers are reporting. How can I turn these account into a positive. I just called Nelnet and you guess it, They don’t know anything about credit reporting. So frustrating!! Take a look at my Guide to the Federal Student Loan Rehabilitation Program, which covers the process of using the OFFICIAL Federal Rehabilitation Program in detail. Is that the one you’re using, or are you using some program offered by one of the Servicing Companies themselves? Are your loans Federal or Private? Are your loans delinquent or in default? I need a little more detail before I can give you any further advice on where to look for information. One thing you could try doing, however, is contacting the credit reporting bureaus themselves directly and asking what their processes are for getting updated information their way. They should be able to provide you with instructions for Nelnet. I would really like to talk with you in regards of this program! I’m a current college student who is in need of second eyes and a hopeful way to resolve a potential huge financial aid mistake through my college. If Mr. Marshall may please e-mail me as soon as possible. I’ll be looking out! I don’t do personal consultations. If you have questions, ask them here in the comments and I’ll let you know my thoughts. Tim I followed your advice and got into a program with the service that you endorsed, what I forgot to do was ask if I still need to file a BDAR on my own? I am an ITT victim and want to get rid of this nightmare. Yeah – you will want to file a BDAR request on your own against the school. Just make sure that you’ve put together a compelling case against them. Have you seen my post about ITT Tech Debt Forgiveness? It may be useful. I have a student loan that I have been paying forever, I also work for the federal government. When I consolidated the loans about 10 years ago i wanted to apply for the student loan forgiveness based on my employment for the government, but they did not offer that to me. I’ve made over 120 payments and wondering if I would still qualify. Check out my Guide to Student Loan Forgiveness for Federal Employees. There’s a good chance that you can qualify IF you’ve been enrolled in an Income-Based Student Loan Repayment Plan. If you are NOT on an IBR or IDR plan, get enrolled in one immediately so that your monthly payments start counting towards a Public Service Loan Forgiveness Discharge (the official name of the Government Employee Forgiveness Program)! Is there a way to pay you for your time to answer a couple questions on my student loan debt? Long story short, My grandfather is a cosigner on my account. I have some federal but mostly private loans from sally mae/navient. I attended the Art Institute of Los Angeles from Jan/2012-Apr/2016. About 1 year into my attendance, for reasons the school would not disclose to me, I was only able to borrow from Sallie Mae. Every other private loan provider refused to work with the Art Institute. Two years later, Sallie Mae stopped providing funding to the students at the Art Institute, in effect making my continued education impossible due to the high out-of-pocket cost of tuition. I have over $150,000 in debt and no degree. The school officially closed 244 days later on 12/16/16 . Do you have a suggestion on what direction to take? I’m sorry, but no I don’t offer any sort of consultation services. 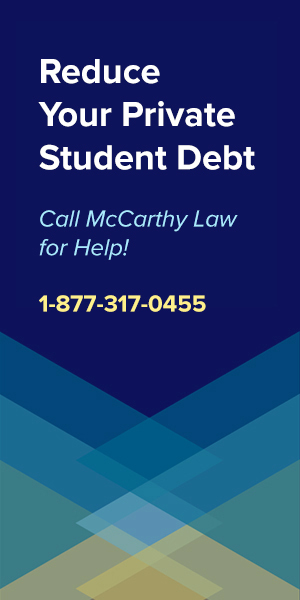 My advice to you would be to get in touch with the Student Loan Ombudsman Group, which is a group of Government-backed attorneys who offer free advice on student loan related issues. Google their name for their contact info, and see what they think you should do. Please come back and let me know when you figure it out, as I’d like to be able to advise others in the same situation as you. And good luck! I attended a University in Montana and graduated back in 2010 with a Business degree. That was the first class that the University tried a block class schedule. We were frequently referred to as the “guinea pigs” because it was their very first business class for the block program. It was like the whole thing was just sloppily put together and they were just using us as test subjects and figuring things out as they went. They didn’t have any interest in our future success, they were just interested in seeing how it all worked. Now 8 years later I still haven’t been able to land a good job. Would this be cause for a legitimate Borrowers Defense Charge? You’re going to need something more damning to get a BDAR request approved here. You have to literally prove that they violated a state or federal law, or defrauded you in some way. This is just some general complaining, not a specific instance of an illegal activity. If they promised you a certain role or position or title or salary, then you’d have something worthy of consideration. Mr. Marshall, I went to a private “career” school back in 1991 or 1992. They were all too happy to sign me up for a small loan through Sallie Mae even though my tuition was paid in full. Fast forward to 1995 and I decided to go to a real college and have my loans in forbearance/deferment while I was in college. I was working fulltime in order to support my family so I could only attend as a part time student. When I called Sallie Mae, they told me that government rules were that if you had taken out loans before 1993 and you were going back to college but only part time, you could not get a forbearance/deferment on those loans unless you took out ANOTHER loan. I thought that it was fishy at the time but who am I to question government rules. Can you please tell me if I was lied to or not? Jeez, this comes from far before I was monitoring the space so I’m not entirely certain what the rules were like back then. Honestly, I think you’ll need to contact the Department of Education for clarification here, but it definitely does sound like you were lied to, and if that is the case, then you MIGHT have a chance at requesting a Borrower’s Defense Discharge. My student loans have been through years deferment and years of forbearance since 2003 with Sallie Mae. I did actually pay $1000 a month for a year or so if not two, I do not really remember, but do remember it was very difficult to pay each month! I am currently disable and awaiting a total and permanent disability loan forgiveness, after my three years of monitoring is up. My physician completed my T & P disability form on June 2017. However, it took them 5 months to process it and at the end of November 2017 is when I received their response, which is when my three year income monitoring began. So until, November 2020 I am a waiting duck…even though I have been disable since 12/2014, I was never offered the T & P disability option…..in 2015 when I called to advise I was ill. BEST PART when I finished school in 2003, I owed $55K now it is a whopping $90K maybe more, by now…. How do I prove I have been taking advantage of? How do I prove the mishandling of my loans and mis-information related to me? Do I need a personal attorney to sue Nelnet? I would contact the Student Loan Ombudsman Group and ask if they can help you. This is a group of student loan lawyers who are backed by the Federal Government and who can take on legal cases for FREE. Google “Student Loan Ombudsman Group” to find their contact information, and good luck! I’m so glad I found your blog website. It seems you’re very knowledgeable about all of this student loan forgiveness. How do you feel about companies that work with clients to help them get into a student loan forgiveness program? I recently spoke with a company called “Higher Level Processing” that helps clients get into any of 30 different forgiveness programs but they do charge 1% of the total loan amount you have. Do you feel this is something worth going for? or is it something that I can do on my own to apply and get into a Student Loan Forgiveness Loan Program specifically the PSLF. The head guy tried to get me to sign up saying, I wouldn’t know how to go about consolidating my loans, I would get the run-around with my loan servicer who would not be honest with me…in the end, he stressed I would be burned and will regret not working with a professional company such as his. What are your thoughts? Should I sign up to be a client of theirs, or can I do this on my own? The company is saying I don’t have much time, as Trump’s administration will likely be rolling out a new program in January 2019. They say this is my one shot and opportunity to get into the forgiveness program without a hitch, and that I can’t afford to mess it up. Sometimes it’s worth it to pay a company for assistance with student loan debt. I refer everyone to a company that I like, called the Student Loan Relief Helpline, which you’ll find listed throughout my site. The reason I like these guys is that they’re honest and straightforward – yes, you’ll have to pay for their assistance, but they’ll get you on the best payment plan, they’ll make sure you don’t miss any rules changes, and they’ll basically fast-track your way to becoming debt free. Don’t listen to this hype about Trump rolling anything new out – there’s no indication that he’s paying attention to student loans at all. He never even brings them up, and hasn’t discussed them basically since he was running for President. He definitely tricked me into thinking that he was going to revolutionize the system, but all I’m seeing is the situation rapidly deteriorating thanks to his DOE appointment of Betsy DeVos. My advice is to figure out if you can qualify for PSLF on your own, and then if you do, get into it. Look at my page on How PSLF Works to find out if you’re eligible. I am considering applying for a job with Kaiser. I read somewhere that hospitals count toward the public services son forgiveness so I was wondering if you know if Kaiser counts as well. Also, I was wondering if you know if after the 25 years of paying (if someone does not do public service), we will have to pay taxes on the amount forgiven. I’m afraid my loans by then will be astronomical as I am only paying a very little amount on the income based plan. To count for PSLF, wherever you work would need to be an official Government institution, or a 501(c)(3) non-profit organization. I do not think Kaiser falls under either of those classifications. Yes, unfortunately, if your debt is forgiven under a plan other than PSLF, then the IRS will want you to pay taxes on whatever amount of money ends up being forgiven. Went to pay on my Navient loan today, and after 16 years of using the website (previously Sallie Mae), there no was clear option for making a payment – 5 days after due date but within the 10 day “not too late” date. They really tried to make it difficult to pay current month without AUTOMATICALLY paying next months as well. You have to go to “Custom Pay” and select “specify for each loan” and make separate payments to add up to total amount due. In 16 years, never had to do that. Had to call and wait on hold to find out that was what I had to do to make my payment. Then there’s a statement that they would “try” to honor my payment wishes. Just some FIY for your arsenal. Tim, I just discovered your website and the Navient lawsuits. Had no idea. I took out two loans in 2001-2003— FFEL Stafford loans–one subsidized, the other unsubsidized. I consolidated them in Nov of 2003 and have been making payments on and off as I could over these past 15 years. ACS was the lender and then sold them to Navient in 2016. I served two years in the Peace Corps from 2007-2009.I made regular payments from 2005-2007, again from 2010-2012 and have been on track now since 2014. I have taken advantage of all my forebearances and deferments and while I was serving in the Peace Corps, the interest on my loan kept on accruing, so that I ended up owing more than I borrowed. No one ever told me about any programs during the time I had my loans with ACS. To be fair, Navient recently offered IBR, but I am still working and making too much money for it to help, but now I understand that in order to take advantage of the PSLF, (I work full time for the state of NC at a psych hospital non-profit) I need to apply for it, but I am 65 and I will never be able to start now. Navient claims not to have a record of all my payments made to ACS and claimed that they (ACS) have them, but ACS denies it and states Navient has them. Finally, Navient stated they would post them and have not after I called them on it. Would this behavior help me in trying for forgiveness you are talking about in the lawsuit? I don’t seem to qualify for any of the other programs, or if I do, the length of time called for is not practical for me now at my age. Options seem to be death or disability at this point. Ugh.. I do think you could try for a Borrower’s Defense Discharge, but it’s a definitely a long shot at this point, because it doesn’t necessarily seem like anything illegal happened here, other than confusion. Here’s what I’d do if I were you – contact the Student Loan Ombudsman Group. This is a group of attorneys that provide free legal advice to Federal loan holders, and they’ve backed by the US Government, so they’re not some kind of private for-profit thing that’s going to charge you for nothing. Google Student Loan Ombudsman Group to find their contact information, call them, and ask them what they think might work best for you. I don’t want to steer you the wrong direction, so I’d defer to their judgment here. I would bet that you’re paying less than the amount of interest that is accumulating each month, which means the loan balance is growing faster than you can pay it down. This happens to tons of people, and it’s one of the reasons why Student Loan Debt can be so damaging to finances. I would speak with a CPA or some kind of financial professional and ask for their guidance on exactly what’s going on here, then figure out a plan for making sure that your loan doesn’t continue to grow. Hi there, really appreciate this site thank you. I am looking for any groups of people we can talk to that have been through the BDAR process/ or any further advice. My husband went to Kaplan in 2004-2006, and we had researched this a few years ago but didn’t think we could qualify for help / didn’t find the right info at the time. Based on recent updates to the BDAR process and new documentation it seems he could be eligible. I understand its a process of filling out the form and supplying as much evidence as possible, but it would be awesome to get any tips or help before doing so, as you really only get one shot. Also curious as to how much evidence you need to provide. We’re talking 12 years and multiple house/country moves since he left the college at this point, he does’t have every piece of paper given to him anymore, nor were conversations recorded etc. Hoping it’s a ‘his word against theirs’ situation, in that they are the ones found guilty of fraud, not him? Is it advisable to get legal advice to write this application? Thank you again for all this info. Maybe you didn’t see it yet, but I wrote a post specifically for Kaplan! Check out my Guide to Getting Kaplan Loans Forgiven! Good question on the tax implications piece, but it’s not up to me. The IRS sets the rules and they say that if you get loan forgiveness, you owe them taxes. There’s a few situations where it doesn’t apply, like if you qualify for Loan Forgiveness under the Public Service Loan Forgiveness Program, but the rules are specifically written into that one to say “You will not have to pay taxes on this type of forgiveness”. If the loan is in her name only and she has to stop working because of a disability, you may be able to qualify for a Total and Permanent Disability Discharge. Google that phrase and you’ll find details on how that program works. If you do qualify, that will probably let you get forgiveness without owing any tax liabilities, so that could be a great option for you. I don’t think you guys will be able to use the married but filing separately strategy for long either, because the IRS changed the rules a few years ago and said that for the purposes of determining income-based student loan payments, we’re going to look at both partner’s income. I believe you’re violating their rules by filing separately for this reason, but you need to consult with a CPA or an attorney on that one to be sure of the law there. I agree the whole system is totally corrupt, absurd and trapping people in inescapable debt. I literally made this site because I was so fed up with hearing the horror stories from friends and family and realizing that no one was advocating on behalf of the little guy. The Government seems to WANT US in debt so that they can continue to control our lives and keep us focused on our own personal problems, and I think it’s a huge issue that we need to face as a country. I do think you’ve got a pretty good shot of getting out of your debt though. I’d start with looking at the Total and Permanent Disability Discharge program, then if that doesn’t work, go to Borrower’s Defense, and if that fails, consider filing for Bankruptcy. It’s not easy to qualify for a bankruptcy discharge, but if your wife ends up disabled and unable to work, then a Bankruptcy court could find in your favor since your debt is so dang high and her income is so dang low. Good luck with everything! I hope it works out! Hi there Tim,Was wandering if you have any recent news regarding For-profit College called The Art Institute, Specifically the Nashville,Tn campus? Many of the campus locations across the Nation have been closing down due to a Out Of Court settlement for the tune of about 99.5 million against the Education Management Corporation (EDMC) for Educational fraud,and predatory lending tactics,along with Falsified salary statistics,and job placement following graduation. Curious as to whether anything has changed regarding discharging these Fraudulent based Federal Loans? Also is there a difference between Forgiveness,and Discharging of these type loans in relation to having to pay taxes or not on forgiven,or Discharged loan balances? I have 110K in signature students loans and I’m a single mother with one child with spina bifida and I’m having trouble paying my monthly payments. The loans were first taken out in 2006. I was currently on a income based repayment for a few years and now it more than doubled. What are my best options? It really depends on whether your loans are Federal or Private, and whether or not you have a shot at getting rid of them via Borrower’s Defense or a Bankruptcy Discharge. You’re going to need to do some research to figure out what your best options are, but I’d start by looking at my pages on Borrower’s Defense Discharges, Private Student Loan Bankruptcy Discharges, Federal Student Loan Bankruptcy Discharges, Private Student Loan Forgiveness Programs and Federal Student Loan Forgiveness Programs. You’ll probably qualify for something considering your loan amount is so high, your income is low (I’m assuming this part since you said you can’t make your payments) and you have a dependent. I recently was released from D.O.C. and I have found out that my school back in 2001 before I was locked up, broke the law, by not checking to see if i had a high school D. or GED, nor did they give me inside school test to see if i could even grasp the education, they knew i was soon going to be locked up. While my schooling, Sandy the teacher felt sorry for my issues, and she allowed me to skate on by with each test, and even the CPR testing, it was with Pima medical for Veterinary Asst. near my last part of the schooling, i found her a better paying job, at a Veterinary clinic which in exchange, i did my internship at her new job, as i lacked the education. i dusted for the remaining of my internship. I did graduated, with no education. I found out in 2012 the school failed, by allowing me to join the school. False Certification of Ability to Benefit Discharge? right? I have submitted this request while i was locked up and the student loan program basically said too sad too bad….Any help from anyone out there? You should be able to use the Borrower’s Defense Discharge to get your loans forgiven because they violated a law by not checking on your diploma or GED, like you said. Did you use Borrower’s Defense with your attempt at the previous Discharge? And who responded to you with too sad too bad? I would consider calling the Student Loan Ombudsman Group (a free service of Government-backed lawyers who advocate on behalf of people with legal student loan-related trouble). Google their name for their contact info, as they should definitely be able to review your case and then work through your problem for you. They’re the best people to get help from, because they’re both free, and Government-backed, so they’ve got some actually authority. I recently became employed with a 501 (c) (3) non-profit organization. I read that after making 120 payments, my loan could be forgiven. How long do I need to be employed with this particular organization, in order to make that a reality? My original student loans were through Sallie Mae. I have loans that Navient now controls, would that be included? It takes 10 years of employment and all your payments MUST be made under one of the Income-Based Student Loan Repayment Plans. Also, this only applies to FEDERAL loans. Doesn’t matter who the servicer is (Sallie Mae vs. Navient vs. whoever), as long as the loans are Federal, they should qualify. I just came up on this, and it’s a wealth of info. I have ~ 170k worth of private loans, I defaulted about 18 months ago. I made few calls to the servicing company, they keep telling the loan is with so and so collection agency. I called the agency, they have no record of me. I’m sure at some point this will pick up steam in worse way. Anything i can do to restart the repayment process, etc? I do have a consigner, none of us have been contacted yet. I want to the right thing, but not sure where to even start at this point. Any suggestion? At some point, someone will probably start calling, sending letters, etc., and trying to recover the money, unless you’re the one in a million who lucks out and they’ve somehow lost your paperwork. It’s definitely possible to restart the payment process, but only if you can figure out who actually owns the loan! You’re going to have to find out who would even accept the payments you’re ready to make, so you can work out new payment terms and start with a rehab process. If you can’t sort it out on your own, I’d try calling the Private Student Loan Relief Helpline to see what they can do to dig around and get you going again. These guys are experts at this exact sort of thing, and while you will have to pay them for their assistance, if you can’t get it done yourself, then you’ve either got to give up and wait, or get somebody to do what you can’t. Hi I just recently called the helpline and I am paying 200 a month for 4 months and then 50-100 for the next months on a 120 month payment plan, no more than 12,000 dollars. I thought this payment was for my student loans, but a few friends and family of mine have told me that could be the profit for the company and not for my student loans. The man I spoke to told me it will take about 2 months for me to find out of I qualify for student loan forgiveness, but my payment of 200 dollars starts this month, so I am a little confused. Some of what you’re paying is going toward the helpline, but you should ask them to clarify how much is going directly to the lender, and how much they’re taking as their fee for helping you get set up. Make sure you know what you’re paying for their assistance so you can determine how much money they’re saving you. I have a long story but I will try to keep it short. I was divorced at a young age and through the poor advice of a friend, I used a private student loan to consolidate some credit card debt that was unknown to me but was left to me by my ex. I fell into a deep depression and began taking medication, that wiped out most of my memory for the next 4 years. I somehow managed to make it through school. I ended up getting remarried and stopped taking my medication. Upon graduation, I began receiving notices in the mail. Apparently, in addition to my federal loans (which are on an income-driven payment plan), I took out private loans to the tune of $65,000.00. This was for an undergraduate degree in sociology, which meant I was qualified to wait tables. As I stated, I do not have any recollection of applying for or accepting this debt. It has been 15 years since I remember taking out the first loan. I have paid and paid and paid for years, but the principle has never moved. I pay close to $800/month. It has always been heavy, but I am emotionally exhausted. I am in my mid thirties haven’t even begun saving for retirement. I do not see how I will ever be able to do so since my balance has never moved. I am so afraid that one day, I am going to default and then the creditors will sue me, intentionally not inform me that I’m being sued and I’ll end up getting arrested for not showing up to court (I have read countless stories of this happening). I am a mother of two young children. I cannot do this anymore. I need help. Are you aware of any opportunities there might be for me to fight this? I have already been driven to bankruptcy once in order to make room to pay for this debt. That was 7 years ago and it just hasn’t been enough to help. I don’t feel that I should have to file a second time when I believe 100% that I was not of sound mind to take this load upon myself. Is there another option? What do you suggest? And how do I find a highly specialized lawyer in my area? Thank you, if you’re still reading. Sorry to hear about your experience. I’m not entirely sure what you would qualify for and how you would be able to go after this because it’s going to be tough, and super niche to be able to get a discharge for not being of sound mind. My best idea for you is to contact a legitimate debt relief organization and see if they think you’d qualify for any of the discharge options. I would probably pursue a Borrower’s Defense to Repayment Discharge if I were you, because maybe you can prove that the school violated some State or Federal law of some sort? If they made any false promises to you, or did anything deceptive or outright illegal, then you can have the loans disbursed entirely. I think you should call the Student Loan Relief Helpline and see what they think your options look like. To be perfectly honest, you’re not in the best spot to get a discharge, but there still might be a chance at making it happen. I’d go this route instead of hiring an attorney because I think that’s going to be a much longer, much more costly way to wage this battle, whereas if you can come up with a good example for the Borrower’s Defense to Repayment Discharge, it’s a much simpler, easier, less expensive process. 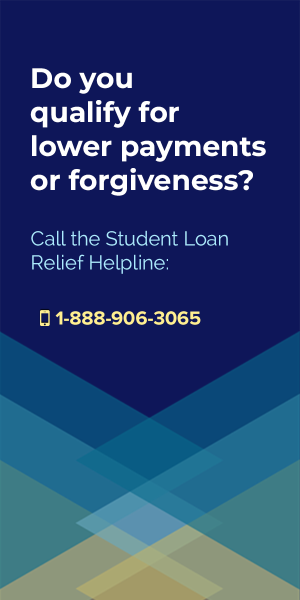 Call the Private Student Loan Relief Helpline and see what they think. You’ll have to pay to get their assistance in pursuing this, but it’s far less expensive than a lawyer, and this is literally all they do. You can reach them at 1-866-530-9946. Can you direct me to a source for this statement? Jill, this is not on the table anymore. President Obama’s administration proposed capping PSLF with their initial 2015 budget, but it was removed and it’s never been discussed since. I’ve noted that throughout the site. You should be far more concerned about what President Trump and Education Secretary Betsy DeVos are up to – they’re trying to completely dismantle the PSLF system. I am in desperate need of help. My student loans have almost doubled. I am very overwhelmed and don’t really know where to start. I do know that I can not battle this process alone. This is not my field of expertise. Are your services for hire or can you recommend someone, for hire? I don’t do any sort of consulting here, but I do recommend that people call the phone numbers I’ve got listed on my site and talk with the Student Loan Relief Helpline. There are a lot of shady operators in this space, but I trust these guys to do a good job of actually HELPING people with their debt. You’ll need to tell them about your situation – giving them all the details about what types of loans you have, how much you owe, how much you’re making, etc., and then they will come up with a plan for attacking your debt. Sometimes, you’re able to enroll in better repayment programs, with lower monthly payments. Sometimes, you’re able to qualify for forgiveness benefits. Sometimes, you’re even able to challenge the legal validity of your loans and get them discharged entirely. Don’t give up! Call the Helpline and see what they can do for you today! Are you aware of a repayment program which will forgive your federal student loans if in a private psychotherapy practice (would bill Medicaid, BCBS etc…) in a rural area? That’s a tough one. I’m not aware of anything that would cover this. PSLF would be the closest thing, but that requires working for the Government or a Nonprofit. As far as I know, there’s nothing like that on the books yet. My husband owes over 150K in private student loans and although we make a good income we pay almost 2k per month for them, Its killing us but would not look like a real hardship. We have been paying them for almost 10 years and the balances are not going down plus he has his father cosign for them and even though we have not missed a payment the lender will not permit co-signer removal which was in the terms of the original loan, What are my options? If your original loan terms included an option for co-signer removal and you have satisfied the obligations required to achieve that, then it’s time to lawyer up and sue the pants off whoever is servicing your husband’s loans. That’s called Breach of Contract, and there’s no way they can legally get away with refusing to comply with their end of the deal. Find an attorney who deals in contract law and start a consultation. Thank you for a most informative website. So much info, but i have questions. Called the number on all of those ads that appear on your site but the woman who answered gave me the impression it was a diffferent company entirely. My direct Stafford unsubsidized for my graduate studies has a balance of about $16,000 with a 6.8% interest rate. During the last ew years, I have fallen on hard times and at one point, was living in my car. So no income until lately where i have a part time job paying me via 1099. Not sure what the bottom line Schedule C income will be, but I visited the gov site and it appears the PAYE program comes out the lowest. What do I do now and how do I estimate my earnings inasmuch as I didn’t file for the last few years taxes with very little, if any, income on the side. Incidentally, i am only half way done on my Master’s program and made 62 this year and thinking of taking my Social Security payment now. Only thing is I’m currently in default with regards to my student loan. What to do? You’re in a really tricky situation… and one that I think will require professional assistance from an attorney. I would see if you can find anyone offering pro bono legal services, or CPA services, and ask them for advice. Thanks for your kind words. Yes, if you’re on the Standard Repayment Plan then those payments you’ve made will not qualify toward your 120 or 240 payment threshold required for loan forgiveness. You need to get on one of the Income-Based Student Loan Repayment Plans (Pay As You Earn or REPAYE) in order to qualify for the benefits. It’s not that big a deal, but get switched as soon as possible so that your payments can start counting! While attending my undergraduate institution, I was guided, by my financial aid department, to take out almost $80,000 in private student loan debt. At the time, being 18 – 22 years of age, I ignorantly, yet willingly, took out debt that I didn’t quite understand nor was it explained to me. I now imagine, knowing that this small, liberal arts college was struggling I financially, that the financial aid advisor was more concerned about the schools account then my sound financial future. It was not until a few years later, upon completion my graduate degree, that my financial aid officer, from Naropa University, explained to me what my situation meant. She expressed shock and disbelief, that an institution would allow a student to make this decision, let alone not fully inform them. I have worked diligently, since graduation in 2012 to repay both my Federal Student Loans and My Private student loans in a reasonable and timely manner, it is not a perfect history but a strong attempt to maintain payments. Currently I pay nearly if not more than half of my income in both of my loans. I am living paycheck to paycheck. I have worked hard to have decent credit and besides my student loans, do not carry much else until recently when I needed to purchase a new vehicle. My federal loans seem manageable, being able to be enrolled in income based repayment and public student loan forgiveness; yet my private loans, even at an income of 30,000 a year, I am possibly covering interest, and that is all: which feels like throwing money in a hole. It’s hard to see me ever paying this debt off, and I can not maintain this financial burden and there is not a willingness to lower my payment. Though I have decent credit, due to substantial student loan debt, private, I would struggle getting a loan if needed or wanted to maintain employment or grow professionally. Sorry to hear about the dilemma you’ve found yourself in. I think you might want to investigate my page on the Defense Against Repayment Provision Discharges and see if you may be able to qualify for a loan discharge based on the faulty information the financial aid department provided. If you can prove that they lied to you or violated a state law in the process of encouraging you to take out that huge loan, you may be able to have the entire thing discharged. I have a private loan for a school that went bankrupt while I was attending. I did not complete the program. I was declined discharge because it is not a federal loan. Do I have any other options? 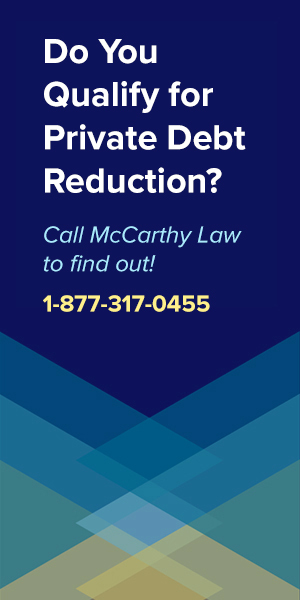 If the school went bankrupt and SHUT DOWN while you were attending, then you may be able to qualify for a complete discharge via the Defense Against Repayment Provision. Check it out, here. Would love to chat with you re: a partnership. I don’t think you’ll be able to get any assistance for the school going bankrupt 5 years after you’ve graduated. There is such a thing as a Closed School Discharge, but that only applies if the school shuts down while you’re still in the process of earning your degree. Are your loans private or federal? You can’t consolidate a single loan… you have to have multiple loans to consolidate them. If you do have multiple loans, are your loans Federal or Private? How much do you owe? Are they in good standing? For my daughter’s college, my wife and I co-signed separate fed loans in addition to my daughter taking out a collegiate loan. I understand that there is no option to consolidate fed loans within one household. Together we are paying over 1400.00 per month. I am looking for the best option to make one payment for all the loans that is affordable. 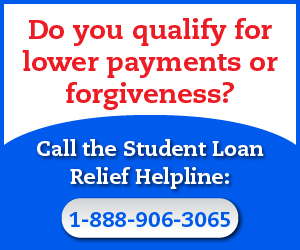 Try contacting the Student Loan Relief Helpline at 1-888-694-8235. They can help with loan consolidation and they can tell you about the different forgiveness benefits programs that you qualify for. I have several loans consolidated, the first one is from basics and my certificate as a paramedic, my second loan is for my bachelor in fine arts, which after I became a certified teacher and worked for three years, then I returned to school and obtained an associates degree as a registered nurse. I worked two years in a not for profit hospital and this is my third year working as a school nurse. I see that I don’t qualify for the nurse relief loan forgiveness program because my loans are consolidated. I would look into the Public Service Loan Forgiveness Program. This is the most effective Federal Student Loan Forgiveness Program available in 2016, as it allows you to earn complete forgiveness from your loan after making just 10 years of qualifying payments. What you’ll need to do is contact the HR department at your work and/or whoever services your loan (the people you send monthly payments to) to find out if you qualify for the benefits. If you do, you’ll need to enroll in one of the Income-Based Federal Student Loan Repayment Programs, and then all you’ll have to do is keep making payments for 10 years until your balance is forgiven. After 15 years I am still fighting to get what I was originally promised in my contract. When my parents signed for me to join the Army Reserves at the age of 17 I was told that I would get the same benefits as the two friends that I referred for enlistment……the loan repayment program. I was 17, never seen a military contract, nor has anyone in my family. Needless to say, the recruiter misled my family and I. Thanks SSG Harkins!!!!! After years of service I have gone back and reviewed that initial contract to find that he really just got me good. After spending six years in the Army Reserves while attending a senior military college I was left holding $22k of college loan at graduation. After graduation and commissioning in the Infantry on Active Duty I continued to research and figure out a way to get college loans paid for. Several advisors urged me to not start payment on them because the military would get the contract fixed and get the loans taken care of. Today, while still serving on active duty, I stand with $36k of student loans (the increase is due to the interest accrued) that I am now paying on. I have served this country for 20+ years and have had a very successful career at all ranks in the military. I don’t qualify for any of the loan repayment programs and for over 15 years I have gotten the shoulder shrug when I discuss my situation with educational benefit counsellors. Everyone that I have spoken with states that it’s a disgrace that the career military members cant get previous college loans paid for but yet no one wants to do anything about it. I understand it’s all recruiting tools but what about those that have chosen to stay the hard course and do what’s right by giving our hearts, souls, and family sacrifices to serve this nation. I’m curious as to how many others are in my same situation and have had any success of being relieved of this debt. The unfortunate fact of the matter is that MANY others are facing the same situation as you (I get comments from them all the time!). The only way to get Military College Loan Repayment Program Benefits is to have them written into your original enlistment contract. When that’s not done, service personnel get screwed. It’s a sad state of affairs, one that recruiters have been taking advantage of for years, and one that should make everyone feel ashamed. Thank you for your service, and I’m sorry that you’re forced to deal with the results of someone else’s failure. I have been in student loan forgiveness program since January 2015 and paid 5.00 a month for 6 consecutive months as required then Nelnet took my loan over and my loans are now in repayment status and zero late payments. I called the WHERE’S MY REFUND and my income tax will be released March 2 nd but is being offset for the whole amount to Dept Management Center!!! I called to make sure everything was good on the 23 93rd and Nelnet said I don’t owe a payment until end of March and The Dept Management Center said no offsets showed from Student loan on the 23 rd..
Can they take all my income tax when I’m not in default????? I think you need to figure out what’s actually going on with your loan and debt. I can’t understand what’s happening based on how you explained it, and it sounds like you don’t know what you actually owe and when payments are due either.